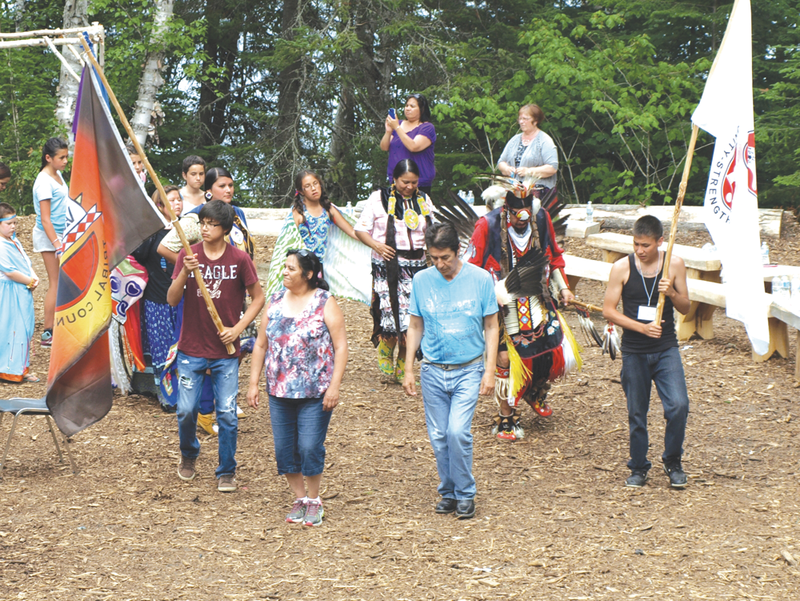 The seventh annual Wabun Youth Gathering held at the Eco Centre Lodge in Elk Lake, Ontario, featured workshops dealing with the critical issues such as suicide prevention, family violence and bullying. Role-playing and skits based on traditional and cultural teachings were utilized to educate participants. Eighty Wabun youth attended the event, which ran from July 15 to 26 and was sponsored by Wabun Tribal Council Health Services. The event was divided into two parts. The first week (July 15-19) was held for junior youth aged from eight to 12 and the second week (July 22-26) was for senior youth aged 13 to 18. The first week of events featured facilitators Craig Fox of Wikwemikong and Dana Cosgrove of Mattagami. Fox, a traditional teacher and dancer, instructed the male youth on preparations and ceremonies concerning powwows and dance. Cosgrove provided presentations for female youth in traditional dances, teachings and songs. A mini powwow, developed and performed by the youth, marked the end of the first week on July 18. The second week featured a series of workshops by Clayton Small, who led discussions and education on suicide prevention skills and peer support. Small, a northern Cheyenne Native American based in Albuquerque, New Mexico, is an Aboriginal leadership specialist who promotes primary suicide intervention techniques. Small also holds a Masters in Education and once held the position of secondary school principal. Jean Lemieux, Health Director of the Wabun Health Services, pointed out that she has seen positive changes in the Wabun First Nations as a result of the Wabun Youth Gathering and the various workshops produced by the health department. “We understand that we must work with our youth from an early age and give them the skills and tools they need to become productive and healthy adults,” said Lemieux. Wabun Youth participants who have been attending the event over the years move into chaperone positions to assist the organizers and facilitators. “I am kind of amazed that they asked me to help as a junior chaperone this year. I always look forward to coming to the gathering and it has helped me in so many ways through all the traditional teachings we get here,” said Mattagami’s Brent Boissoneau, 14. For the first year ever the featured drum-and-singing group came from a Wabun community. The Big Bear Claw Singers of Brunswick House, led by Jason Saunders performed traditional songs. Elder Vina Hendrix, of Matachewan, who has been attending the gathering for years, was once again on hand to provide teachings to the youth. “This is one of the best things that has ever happened to our First Nations and it provides the opportunity for our youth to gather with each other, our leaders and Elders to learn more about our culture and traditions,” commented Hendrix. Chief Walter Naveau of Mattagami, Chief Elenore Hendrix of Matachewan and Chief Marcia Martel Brown of Beaverhouse were on hand to lend their support and counsel to the event organizers and youth in attendance. “These young people are our leaders of tomorrow and it is up to us to make sure we do all we can to assist them to become strong and healthy. 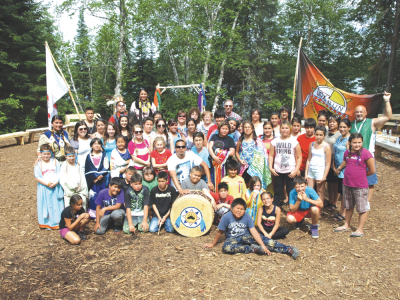 It makes me feel very proud and optimistic to see these Wabun youth learning our culture and traditions,” said Naveau. Hendrix and Martel Brown congratulated the event organizers and youth for producing over the years what has become a major First Nation event. Mike Archer, Community Crisis Coordinator, Wabun Health Services, has been coordinating the event for the past seven years. “The Wabun Youth Gathering is the kind of healing that we need more of in our First Nations because it is based on the teachings of tradition and culture. We can only progress and make things better for ourselves as First Nation people if we decide that we really want change and to develop healthy and strong communities,” said Archer. Morris Naveau, an Elder and a residential school survivor, was on hand to assist with the senior Wabun youth and to share his story of struggle and survival. Veteran senior Wabun youth participant Samuel Kloetstra of Mattagami pointed out that the event has provided him with confidence and many skills to deal with life. In fact he was selected to sit on the Minister of Ontario’s Student Advisory Council as an Aboriginal representative. The Wabun Youth Gathering came out of the vision and guidance of the late Elder Thomas Saunders, of Brunswick House, who wanted to see the Wabun communities come together in one gathering. Wabun Tribal Council is a regional territorial organization that represents the First Nation communities of Beaverhouse, Brunswick House, Chapleau Ojibwe, Flying Post, Matachewan and Mattagami in northeastern Ontario.